Mood disorder, also known as mood affective disorders, is a group of conditions where a disturbance in the person's mood is the main underlying feature. The classification is in the Diagnostic and Statistical Manual of Mental Disorders (DSM) and International Classification of Diseases (ICD). Mood disorders fall into the basic groups of elevated mood, such as mania or hypomania; depressed mood, of which the best-known and most researched is major depressive disorder (MDD) (commonly called clinical depression, unipolar depression, or major depression); and moods which cycle between mania and depression, known as bipolar disorder (BD) (formerly known as manic depression). There are several sub-types of depressive disorders or psychiatric syndromes featuring less severe symptoms such as dysthymic disorder (similar to but milder than MDD) and cyclothymic disorder (similar to but milder than BD). [page needed] Mood disorders may also be substance induced or occur in response to a medical condition. English psychiatrist Henry Maudsley proposed an overarching category of affective disorder. The term was then replaced by mood-disorder, as the latter term refers to the underlying or longitudinal emotional state, whereas the former refers to the external expression observed by others. Major depressive disorder (MDD), commonly called major depression, unipolar depression, or clinical depression, wherein a person has one or more major depressive episodes. After a single episode, Major Depressive Disorder (single episode) would be diagnosed. After more than one episode, the diagnosis becomes Major Depressive Disorder (Recurrent). Depression without periods of mania is sometimes referred to as unipolar depression because the mood remains at the bottom "pole" and does not climb to the higher, manic "pole" as in bipolar disorder. Individuals with a major depressive episode or major depressive disorder are at increased risk for suicide. Seeking help and treatment from a health professional dramatically reduces the individual's risk for suicide. Studies have demonstrated that asking if a depressed friend or family member has thought of committing suicide is an effective way of identifying those at risk, and it does not "plant" the idea or increase an individual's risk for suicide in any way. Epidemiological studies carried out in Europe suggest that, at this moment, roughly 8.5 percent of the world's population have a depressive disorder. No age group seems to be exempt from depression, and studies have found that depression appears in infants as young as 6 months old who have been separated from their mothers. 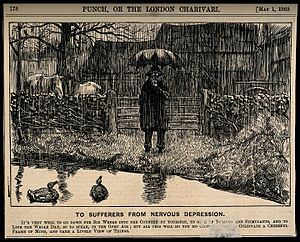 Atypical depression (AD) is characterized by mood reactivity (paradoxical anhedonia) and positivity, significant weight gain or increased appetite ("comfort eating"), excessive sleep or somnolence (hypersomnia), a sensation of heaviness in limbs known as leaden paralysis, and significant social impairment as a consequence of hypersensitivity to perceived interpersonal rejection. Difficulties in measuring this subtype have led to questions of its validity and prevalence. Postpartum depression (PPD) is listed as a course specifier in DSM-IV-TR; it refers to the intense, sustained and sometimes disabling depression experienced by women after giving birth. Postpartum depression, which affects 10–15% of women, typically sets in within three months of labor, and lasts as long as three months. It is quite common for women to experience a short-term feeling of tiredness and sadness in the first few weeks after giving birth; however, postpartum depression is different because it can cause significant hardship and impaired functioning at home, work, or school as well as, possibly, difficulty in relationships with family members, spouses, or friends, or even problems bonding with the newborn. In the treatment of postpartum major depressive disorders and other unipolar depressions in women who are breastfeeding, nortriptyline, paroxetine (Paxil), and sertraline (Zoloft) are in general considered to be the preferred medications. Women with personal or family histories of mood disorders are at particularly high risk of developing postpartum depression. Premenstrual dysphoric disorder (PMDD) is a severe and disabling form of premenstrual syndrome affecting 3–8% of menstruating women. The disorder consists of a "cluster of affective, behavioral and somatic symptoms" that recur monthly during the luteal phase of the menstrual cycle. PMDD was added to the list of depressive disorders in the Diagnostic and Statistical Manual of Mental Disorders in 2013. The exact pathogenesis of the disorder is still unclear and is an active research topic. Treatment of PMDD relies largely on antidepressants that modulate serotonin levels in the brain via serotonin reuptake inhibitors as well as ovulation suppression using contraception. Seasonal affective disorder (SAD), also known as "winter depression" or "winter blues", is a specifier. Some people have a seasonal pattern, with depressive episodes coming on in the autumn or winter, and resolving in spring. The diagnosis is made if at least two episodes have occurred in colder months with none at other times over a two-year period or longer. It is commonly hypothesised that people who live at higher latitudes tend to have less sunlight exposure in the winter and therefore experience higher rates of SAD, but the epidemiological support for this proposition is not strong (and latitude is not the only determinant of the amount of sunlight reaching the eyes in winter). It is said that this disorder can be treated by light therapy. SAD is also more prevalent in people who are younger and typically affects more females than males. Double depression can be defined as a fairly depressed mood (dysthymia) that lasts for at least two years and is punctuated by periods of major depression. Depressive Disorder Not Otherwise Specified (DD-NOS) is designated by the code 311 for depressive disorders that are impairing but do not fit any of the officially specified diagnoses. According to the DSM-IV, DD-NOS encompasses "any depressive disorder that does not meet the criteria for a specific disorder." It includes the research diagnoses of recurrent brief depression, and minor depressive disorder listed below. Bipolar Disorder Not Otherwise Specified (BD-NOS), sometimes called "sub-threshold" bipolar, indicates that the patient has some symptoms in the bipolar spectrum (e.g., manic and depressive symptoms) but does not fully qualify for any of the three formal bipolar DSM-IV diagnoses mentioned above. It is estimated that roughly 1% of the adult population has bipolar I, a further 1% has bipolar II or cyclothymia, and somewhere between 2% and 5% percent have "sub-threshold" forms of bipolar disorder. Furthermore the possibility of getting bipolar disorder when one parent is diagnosed with it is 15–30%. Risk when both parents have it is 50–75%. Also, while with bipolar siblings the risk is 15–25%, with identical twins it is about 70%. A minority of people with bipolar disorder have high creativity, artistry or a particular gifted talent. Before the mania phase becomes too extreme, its energy, ambition, enthusiasm and grandiosity often bring people with this type of mood disorder life's masterpieces. A mood disorder can be classified as substance-induced if its etiology can be traced to the direct physiologic effects of a psychoactive drug or other chemical substance, or if the development of the mood disorder occurred contemporaneously with substance intoxication or withdrawal. Also, an individual may have a mood disorder coexisting with a substance abuse disorder. Substance-induced mood disorders can have features of a manic, hypomanic, mixed, or depressive episode. Most substances can induce a variety of mood disorders. For example, stimulants such as amphetamine, methamphetamine, and cocaine can cause manic, hypomanic, mixed, and depressive episodes. High rates of major depressive disorder occur in heavy drinkers and those with alcoholism. Controversy has previously surrounded whether those who abused alcohol and developed depression were self-medicating their pre-existing depression. But recent research has concluded that, while this may be true in some cases, alcohol misuse directly causes the development of depression in a significant number of heavy drinkers. Participants studied were also assessed during stressful events in their lives and measured on a Feeling Bad Scale. Likewise, they were also assessed on their affiliation with deviant peers, unemployment, and their partner’s substance use and criminal offending. High rates of suicide also occur in those who have alcohol-related problems. It is usually possible to differentiate between alcohol-related depression and depression that is not related to alcohol intake by taking a careful history of the patient. Depression and other mental health problems associated with alcohol misuse may be due to distortion of brain chemistry, as they tend to improve on their own after a period of abstinence. Benzodiazepines are a class of medication commonly used to treat anxiety, panic attacks and insomnia, and are also commonly misused and abused. Those with anxiety, panic and sleep problems commonly have negative emotions and thoughts, depression, suicidal ideations, and often have comorbid depressive disorders. While the anxiolytic and hypnotic effects of benzodiazepines disappear as tolerance develops, depression and impulsivity with high suicidal risk commonly persist. Unfortunately, these symptoms are “often interpreted as an exacerbation or as a natural evolution of previous disorders and the chronic use of sedatives is overlooked.” Benzodiazepines do not prevent the development of depression, can exacerbate preexisting depression, can cause depression in those with no history of it, and can lead to suicide attempts. Risk factors for attempted and completed suicide while using benzodiazepines include high dose prescriptions (even in those not misusing the medications), benzodiazepine intoxication, and underlying depression. The long-term use of benzodiazepines may have a similar effect on the brain as alcohol, and are also implicated in depression. As with alcohol, the effects of benzodiazepine on neurochemistry, such as decreased levels of serotonin and norepinephrine, are believed to be responsible for the increased depression. Additionally, benzodiazepines can indirectly worsen mood by worsening sleep (i.e., benzodiazepine-induced sleep disorder). Like alcohol, benzodiazepines can put people to sleep but, while asleep, they disrupt sleep architecture: decreasing sleep time, delaying time to REM sleep, and decreasing deep sleep (the most restorative part of sleep for both energy and mood). Just as some antidepressants can cause or worsen anxiety in some patients due to being activating, benzodiazepines can cause or worsen depression due to being a central nervous system depressant—worsening thinking, concentration and problem solving (i.e., benzodiazepine-induced neurocognitive disorder). However, unlike antidepressants, in which the activating effects usually improve with continued treatment, benzodiazepine-induced depression is unlikely to improve until after stopping the medication. "Mood disorder due to a general medical condition" is used to describe manic or depressive episodes which occur secondary to a medical condition. There are many medical conditions that can trigger mood episodes, including neurological disorders (e.g. dementias), metabolic disorders (e.g. electrolyte disturbances), gastrointestinal diseases (e.g. cirrhosis), endocrine disease (e.g. thyroid abnormalities), cardiovascular disease (e.g. heart attack), pulmonary disease (e.g. chronic obstructive pulmonary disease), cancer, and autoimmune diseases . Mood disorder not otherwise specified (MD-NOS) is a mood disorder that is impairing but does not fit in with any of the other officially specified diagnoses. In the DSM-IV MD-NOS is described as "any mood disorder that does not meet the criteria for a specific disorder." MD-NOS is not used as a clinical description but as a statistical concept for filing purposes. Most cases of MD-NOS represent hybrids between mood and anxiety disorders, such as mixed anxiety-depressive disorder or atypical depression. An example of an instance of MD-NOS is being in minor depression frequently during various intervals, such as once every month or once in three days. There is a risk for MD-NOS not to get noticed, and for that reason not to get treated. Meta-analyses show that high scores on the personality domain neuroticism is a strong predictor for the development of mood disorders. A number of authors have also suggested that mood disorders are an evolutionary adaptation. A low or depressed mood can increase an individual's ability to cope with situations in which the effort to pursue a major goal could result in danger, loss, or wasted effort. In such situations, low motivation may give an advantage by inhibiting certain actions. This theory helps to explain why negative life incidents precede depression in around 80 percent of cases, and why they so often strike people during their peak reproductive years. These characteristics would be difficult to understand if depression were a dysfunction. A depressed mood is a predictable response to certain types of life occurrences, such as loss of status, divorce, or death of a child or spouse. These are events that signal a loss of reproductive ability or potential, or that did so in humans' ancestral environment. A depressed mood can be seen as an adaptive response, in the sense that it causes an individual to turn away from the earlier (and reproductively unsuccessful) modes of behavior. Much of what we know about the genetic influence of clinical depression is based upon research that has been done with identical twins. Identical twins both have exactly the same genetic code. It has been found that when one identical twin becomes depressed the other will also develop clinical depression approximately 76% of the time. When identical twins are raised apart from each other, they will both become depressed about 67% of the time. Because both twins become depressed at such a high rate, the implication is that there is a strong genetic influence. If it happened that when one twin becomes clinically depressed the other always develops depression, then clinical depression would likely be entirely genetic. Bipolar disorder is also considered a mood disorder and it is hypothesized that it might be caused by mitochondrial dysfunction or mitochondrial disease. The DSM-5, released in May 2013, separates the mood disorder chapter from the DSM-TR-IV into two sections: Depressive and Related Disorders and Bipolar and Related Disorders. Bipolar Disorders falls in between Depressive Disorders and Schizophrenia Spectrum and Related Disorders “in recognition of their place as a bridge between the two diagnostic classes in terms of symptomatology, family history and genetics” (Ref. 1, p 123). Bipolar Disorders underwent a few changes in the DSM-5, most notably the addition of more specific symptomology related to hypomanic and mixed manic states. Depressive Disorders underwent the most changes, the addition of three new disorders: disruptive mood dysregulation disorder, persistent depressive disorder (previously dysthymia), and premenstrual dysphoric disorder (previously in Appendix B, the section for disorders needing further research). Disruptive mood dysregulation disorder is meant as a diagnosis for children and adolescents who would normally be diagnosed with bipolar disorder as a way to limit the bipolar diagnosis in this age cohort. Major depressive disorder (MDD) also underwent a notable change, in that the bereavement clause has been removed. Those previously exempt from a diagnosis of MDD due to bereavement are now candidates for the MDD diagnosis. There are different types of treatments available for mood disorders, such as therapy and medications. Behaviour therapy, cognitive behaviour therapy and interpersonal therapy have all shown to be potentially beneficial in depression. Major depressive disorder medications usually include antidepressants, while bipolar disorder medications can consist of antipsychotics, mood stabilizers, anticonvulsants and/or lithium. Lithium specifically has been proven to reduce suicide and all causes of mortality in people with mood disorders. If mitochondrial dysfunction or mitochondrial diseases are the cause of mood disorders like bipolar disorder, then it has been hypothesized that N-acetyl-cysteine (NAC), acetyl-L-carnitine (ALCAR), S-adenosylmethionine (SAMe), coenzyme Q10 (CoQ10), alpha-lipoic acid (ALA), creatine monohydrate (CM), and melatonin could be potential treatment options. In determining treatment, there are many types of depression scales that are used. One of the depression scales is a self-report scale called Beck Depression Inventory (BDI). Another scale is the Hamilton Depression Rating Scale (HAMD). HAMD is a clinical rating scale in which the patient is rated based on clinician observation. The Center for Epidemiologic Studies Depression Scale (CES-D) is a scale for depression symptoms that applies to the general population. This scale is typically used in research and not for self-reports. The PHQ-9 which stands for Patient-Health Questionnaire-9 questions, is a self-report as well. Finally, the Mood Disorder Questionnaire (MDQ) evaluates bipolar disorder. In 2011, mood disorders were the most common reason for hospitalization among children aged 1–17 years in the United States, with approximately 112,000 stays. Mood disorders were top principal diagnosis for Medicaid super-utilizers in the United States in 2012. Further, a study of 18 States found that mood disorders accounted for the highest number of hospital readmissions among Medicaid patients and the uninsured, with 41,600 Medicaid patients and 12,200 uninsured patients being readmitted within 30 days of their index stay—a readmission rate of 19.8 per 100 admissions and 12.7 per 100 admissions, respectively. In 2012, mood and other behavioral health disorders were the most common diagnoses for Medicaid-covered and uninsured hospital stays in the United States (6.1% of Medicaid stays and 5.2% of uninsured stays). Kay Redfield Jamison and others have explored the possible links between mood disorders — especially bipolar disorder — and creativity. It has been proposed that a "ruminating personality type may contribute to both [mood disorders] and art." The relationship between depression and creativity appears to be especially strong among poets. ^ Lewis, AJ (1934). "Melancholia: A Historical Review". Journal of Mental Science. 80 (328): 1–42. doi:10.1192/bjp.80.328.1. Archived from the original on 15 December 2008. ^ Berrios, G E (1985). "The Psychopathology of Affectivity: Conceptual and Historical Aspects". Psychological Medicine. 15 (4): 745–758. doi:10.1017/S0033291700004980. PMID 3909185. ^ The ICD-10 Classification of Mental and Behavioural Disorders. World Health Organisation. 1993. ^ Ayuso-Mateos J.L. ; et al. (2001). "Depressive Disorders in Europe: Prevalence figures from the ODIN study". British Journal of Psychiatry. 179 (4): 308–316. doi:10.1192/bjp.179.4.308. ^ Gelder & Mayou, Geddes (2005). Psychiatry: Page 170. New York, NY; Oxford University Press Inc.
^ O'Hara, Michael W. "Postpartum Depression: Causes and consequences." 1995. ^ Weissman AM, Levy BT, Hartz AJ, Bentler S, Donohue M, Ellingrod VL, Wisner KL (2004). "Pooled analysis of antidepressant levels in lactating mothers, breast milk, and nursing infants". Am J Psychiatry. 161 (6): 1066–78. doi:10.1176/appi.ajp.161.6.1066. PMID 15169695. ^ a b c Rapkin, AJ; Lewis, EI (November 2013). "Treatment of premenstrual dysphoric disorder". Womens Health (Lond Engl). 9 (6): 537–56. doi:10.2217/whe.13.62. PMID 24161307. ^ American Psychiatric Association (2013). Diagnostic and statistical manual of mental disorders : DSM-5 (5th ed.). Washington, D.C.: American Psychiatric Association. pp. 171–175. ISBN 978-0-89042-554-1. ^ Rosenthal, N.E (1984). "A Description of the syndrome and preliminary findings with Light Therapy". Archives of General Psychiatry. 41 (1): 72–80. doi:10.1001/archpsyc.1984.01790120076010. PMC 2686645. PMID 6581756. ^ Lam Raymond W.; Levitan Robert D. (2000). "Pathophysiology of seasonal affective disorder: a review". Journal of Psychiatry and Neuroscience. 25 (5): 469–480. PMC 1408021. PMID 11109298. ^ a b Schacter, Daniel L., Daniel T. Gilbert, and Daniel M. Wegner. "Chapter 14: Psychological Disorders." Psychology. ; Second Edition. N.p. : Worth, Incorporated, 2010. 564–65. Print. ^ Carta, Mauro Giovanni; Altamura, Alberto Carlo; Hardoy, Maria Carolina; et al. (2003). "Is recurrent brief depression an expression of mood spectrum disorders in young people?". European Archives of Psychiatry and Clinical Neuroscience. 253 (3): 149–53. doi:10.1007/s00406-003-0418-5. PMID 12904979. ^ Rapaport MH, Judd LL, Schettler PJ, Yonkers KA, Thase ME, Kupfer DJ, Frank E, Plewes JM, Tollefson GD, Rush AJ (2002). "A descriptive analysis of minor depression". American Journal of Psychiatry. 159 (4): 637–43. doi:10.1176/appi.ajp.159.4.637. PMID 11925303. ^ a b D. Schacter; D. Gilbert; D. Wegner (2011). Psychology 2nd Ed. Worth Publishers. p. 570. ^ Reviewed by Melissa Conrad Stöppler, MD. "Bipolar Disorder (cont.)". MedicineNet, Inc. Archived from the original on 18 October 2013. Retrieved 27 October 2013. ^ Fergusson DM, Boden JM, Horwood LJ (March 2009). "Tests of causal links between alcohol abuse or dependence and major depression". Arch. Gen. Psychiatry. 66 (3): 260–6. doi:10.1001/archgenpsychiatry.2008.543. PMID 19255375. ^ Falk DE, Yi HY, Hilton ME (April 2008). "Age of Onset and Temporal Sequencing of Lifetime DSM-IV Alcohol Use Disorders Relative to Comorbid Mood and Anxiety Disorders". Drug Alcohol Depend. 94 (1–3): 234–45. doi:10.1016/j.drugalcdep.2007.11.022. PMC 2386955. PMID 18215474. ^ a b Schuckit MA, Smith TL, Danko GP, et al. (November 2007). "A comparison of factors associated with substance-induced versus independent depressions". J Stud Alcohol Drugs. 68 (6): 805–12. doi:10.15288/jsad.2007.68.805. PMID 17960298. ^ Chignon JM, Cortes MJ, Martin P, Chabannes JP (1998). "[Attempted suicide and alcohol dependence: results of an epidemiologic survey]". Encephale (in French). 24 (4): 347–54. PMID 9809240. ^ Schuckit MA, Tipp JE, Bergman M, Reich W, Hesselbrock VM, Smith TL (July 1997). "Comparison of induced and independent major depressive disorders in 2,945 alcoholics". Am J Psychiatry. 154 (7): 948–57. CiteSeerX 10.1.1.461.7953. doi:10.1176/ajp.154.7.948. PMID 9210745. ^ Schuckit MA, Tipp JE, Bucholz KK, et al. (October 1997). "The life-time rates of three major mood disorders and four major anxiety disorders in alcoholics and controls". Addiction. 92 (10): 1289–304. doi:10.1111/j.1360-0443.1997.tb02848.x. PMID 9489046. Archived from the original on 5 December 2012. ^ Wetterling T, Junghanns K (December 2000). "Psychopathology of alcoholics during withdrawal and early abstinence". Eur Psychiatry. 15 (8): 483–8. doi:10.1016/S0924-9338(00)00519-8. PMID 11175926. ^ a b c American Psychiatric Association (2013). Diagnostic and statistical manual of mental disorders, fifth edition. Arlington, VA: American Psychiatric Association. ^ a b c d Michelini, S.; Cassano, G. B.; Frare, F.; Perugi, G. (1 July 1996). "Long-term use of benzodiazepines: tolerance, dependence and clinical problems in anxiety and mood disorders". Pharmacopsychiatry. 29 (4): 127–134. doi:10.1055/s-2007-979558. ISSN 0176-3679. PMID 8858711. ^ Lydiard, R. B.; Brawman-Mintzer, O.; Ballenger, J. C. (1 August 1996). "Recent developments in the psychopharmacology of anxiety disorders". Journal of Consulting and Clinical Psychology. 64 (4): 660–668. doi:10.1037/0022-006x.64.4.660. ISSN 0022-006X. PMID 8803355. ^ Baldwin, David S.; Anderson, Ian M.; Nutt, David J.; Bandelow, Borwin; Bond, A.; Davidson, Jonathan R. T.; den Boer, J. A.; Fineberg, Naomi A.; Knapp, Martin (1 November 2005). "Evidence-based guidelines for the pharmacological treatment of anxiety disorders: recommendations from the British Association for Psychopharmacology". Journal of Psychopharmacology (Oxford, England). 19 (6): 567–596. doi:10.1177/0269881105059253. ISSN 0269-8811. PMID 16272179. ^ Ashton, H. (1 June 1987). "Benzodiazepine withdrawal: outcome in 50 patients". British Journal of Addiction. 82 (6): 665–671. doi:10.1111/j.1360-0443.1987.tb01529.x. ISSN 0952-0481. PMID 2886145. ^ Gelpin, E.; Bonne, O.; Peri, T.; Brandes, D.; Shalev, A. Y. (1 September 1996). "Treatment of recent trauma survivors with benzodiazepines: a prospective study". The Journal of Clinical Psychiatry. 57 (9): 390–394. ISSN 0160-6689. PMID 9746445. ^ Hawkins, Eric J.; Malte, Carol A.; Imel, Zac E.; Saxon, Andrew J.; Kivlahan, Daniel R. (1 July 2012). "Prevalence and trends of benzodiazepine use among Veterans Affairs patients with posttraumatic stress disorder, 2003–2010". Drug and Alcohol Dependence. 124 (1–2): 154–161. doi:10.1016/j.drugalcdep.2012.01.003. ISSN 1879-0046. PMID 22305658. ^ Pfeiffer, Paul N.; Ganoczy, Dara; Ilgen, Mark; Zivin, Kara; Valenstein, Marcia (1 January 2009). "Comorbid Anxiety as a Suicide Risk Factor Among Depressed Veterans". Depression and Anxiety. 26 (8): 752–757. doi:10.1002/da.20583. ISSN 1091-4269. PMC 2935592. PMID 19544314. ^ Semple, David; Roger Smyth; Jonathan Burns; Rajan Darjee; Andrew McIntosh (2007) . "13". Oxford Handbook of Psychiatry. United Kingdom: Oxford University Press. p. 540. ISBN 978-0-19-852783-1. ^ Collier, Judith; Longmore, Murray (2003). "4". In Scally, Peter (ed.). Oxford Handbook of Clinical Specialties (6 ed.). Oxford University Press. p. 366. ISBN 978-0-19-852518-9. ^ Professor Heather Ashton (2002). "Benzodiazepines: How They Work and How to Withdraw". ^ Lydiard RB, Laraia MT, Ballenger JC, Howell EF (May 1987). "Emergence of depressive symptoms in patients receiving alprazolam for panic disorder". Am J Psychiatry. 144 (5): 664–5. doi:10.1176/ajp.144.5.664. PMID 3578580. ^ Nathan RG, Robinson D, Cherek DR, Davison S, Sebastian S, Hack M (1 January 1985). "Long-term benzodiazepine use and depression". Am J Psychiatry. 142 (1): 144–5. doi:10.1176/ajp.142.1.144-b. PMID 2857068. ^ Longo, L. P.; Johnson, B. (1 April 2000). "Addiction: Part I. Benzodiazepines—side effects, abuse risk and alternatives". American Family Physician. 61 (7): 2121–2128. ISSN 0002-838X. PMID 10779253. ^ Tasman A, Kay J, Lieberman JA, eds. (2008). Psychiatry, third edition. Chichester, England: John Wiley & Sons. pp. 2603–2615. ^ Ashton, Heather (1 May 2005). "The diagnosis and management of benzodiazepine dependence". Current Opinion in Psychiatry. 18 (3): 249–255. doi:10.1097/01.yco.0000165594.60434.84. ISSN 0951-7367. PMID 16639148. ^ Morin, Charles M.; Bélanger, Lynda; Bastien, Célyne; Vallières, Annie (1 January 2005). "Long-term outcome after discontinuation of benzodiazepines for insomnia: a survival analysis of relapse". Behaviour Research and Therapy. 43 (1): 1–14. doi:10.1016/j.brat.2003.12.002. ISSN 0005-7967. PMID 15531349. ^ Poyares, Dalva; Guilleminault, Christian; Ohayon, Maurice M.; Tufik, Sergio (1 June 2004). "Chronic benzodiazepine usage and withdrawal in insomnia patients". Journal of Psychiatric Research. 38 (3): 327–334. doi:10.1016/j.jpsychires.2003.10.003. ISSN 0022-3956. PMID 15003439. ^ Professor C Heather Ashton (1987). "Benzodiazepine Withdrawal: Outcome in 50 Patients". British Journal of Addiction. 82: 655–671. ^ Fyer AJ, Liebowitz MR, Gorman JM, Campeas R, Levin A, Davies SO, Goetz D, Klein DF (March 1987). "Discontinuation of Alprazolam Treatment in Panic Patients". Am J Psychiatry. 144 (3): 303–8. doi:10.1176/ajp.144.3.303. PMID 3826428. Retrieved 10 December 2008. ^ Modell JG (March – April 1997). "Protracted benzodiazepine withdrawal syndrome mimicking psychotic depression" (PDF). Psychosomatics. 38 (2): 160–1. doi:10.1016/S0033-3182(97)71493-2. PMID 9063050. Archived from the original (PDF) on 25 June 2008. ^ Lader M (1994). "Anxiety or depression during withdrawal of hypnotic treatments". J Psychosom Res. 38 (Suppl 1): 113–23, discussion 118–23. doi:10.1016/0022-3999(94)90142-2. PMID 7799243. ^ Ashton CH (March 1995). "Protracted Withdrawal From Benzodiazepines: The Post-Withdrawal Syndrome". Psychiatric Annals. 25 (3): 174–179. doi:10.3928/0048-5713-19950301-11. ^ Professor Heather Ashton (2004). "Protracted Withdrawal Symptoms From Benzodiazepines". Comprehensive Handbook of Drug & Alcohol Addiction. ^ a b American Psychiatric Association (2000). Diagnostic and statistical manual of mental disorders. (4th ed.). ^ a b HAGOP S. AKISKAL, M.D. (2 November 2004). "MOOD DISORDERS: CLINICAL FEATURES" (PDF). Kaplan & Sadock’s Comprehensive Textbook of Psychiatry. Archived (PDF) from the original on 10 June 2015. Retrieved 21 March 2013. ^ Williams Daniel T.; Hirsch Scott; Coffey Barbara (2007). "Mood and Anxiety Symptoms in An Adolescent with Pervasive Developmental Disorder Not Otherwise Specified and Moderate Mental Retardation". Journal of Child and Adolescent Psychopharmacology. 17 (5): 721–726. doi:10.1089/cap.2007.17503. PMID 17979592. ^ Jeronimus; et al. (2016). "Neuroticism's prospective association with mental disorders: A meta-analysis on 59 longitudinal/prospective studies with 443 313 participants". Psychological Medicine. 46 (14): 2883–2906. doi:10.1017/S0033291716001653. PMID 27523506. ^ Allen, N.; Badcock, P. (2006). "Darwinian models of depression: A review of evolutionary accounts of mood and mood disorders". Progress in Neuro-Psychopharmacology and Biological Psychiatry. 30 (5): 815–826. doi:10.1016/j.pnpbp.2006.01.007. PMID 16647176. ^ a b Nesse R (2000). "Is Depression an Adaptation?" (PDF). Arch. Gen. Psychiatry. 57 (1): 14–20. CiteSeerX 10.1.1.318.2659. doi:10.1001/archpsyc.57.1.14. PMID 10632228. Archived (PDF) from the original on 25 November 2011. ^ Kessler, R (1997). "The Effects of Stressful Life Events on Depression". Annual Review of Psychology. 48: 191–214. doi:10.1146/annurev.psych.48.1.191. PMID 9046559. ^ Nolen-Hoeksema, S (2013). Abnormal Psychology (6th ed.). McGraw-Hill Higher Education. p. 188. ISBN 9780077499693. Retrieved 5 December 2014. ^ a b Pieczenik, Steve R, Neustadt, John (2007). "Mitochondrial dysfunction and molecular pathways of disease". Experimental and Molecular Pathology. 83 (1): 84–92. doi:10.1016/j.yexmp.2006.09.008. PMID 17239370. ^ Scainiab, Giselli, Rezinc, Gislaine, Carvalhod, Andre, Streckb, Emilio L, Berkef, Michael, Quevedo, João (2016). "Mitochondrial dysfunction in bipolar disorder: Evidence, pathophysiology and translational implications". Neurosci Biobehav Rev. 68: 694–713. doi:10.1016/j.neubiorev.2016.06.040. PMID 27377693. ^ American Psychiatric Association (2013). Diagnostic and Statianual (5th ed.). Arlington, VA: American Psychiatric Association. ^ Parker, George (2014). "DSM-5 and Psychotic and Mood Disorders". Journal of the American Academy of Psychiatry and the Law. 42: 182–190. ^ Nolen-Hoeksema, S (2013). Abnormal Psychology (6th ed.). McGraw-Hill Higher Education. p. 203. ISBN 9780077499693. Retrieved 5 December 2014. ^ Weston, Drew; Morrison, Kate (2001). "A multidimensional meta-analysis of treatments for depression, panic, and generalized anxiety disorder: An empirical examination of the status of empirically supported therapies". Journal of Consulting and Clinical Psychology. 69 (6): 875–899. CiteSeerX 10.1.1.200.7241. doi:10.1037/0022-006X.69.6.875. ^ Keck Jr., Paul E.; McElroy, Susan L.; Strakowski, Stephen M. (1998). "Anticonvulsants and antipsychotics in the treatment of bipolar disorder". The Journal of Clinical Psychiatry. 59 (Suppl 6): 74–82. PMID 9674940. ^ Cipriani, A (2013). "Lithium in the prevention of suicide in mood disorders: updated systematic review and meta-analysis". DARE: 1. ^ Nierenberg, Andrew A, Kansky, Christine, Brennan, Brian P, Shelton, Richard C, Perlis, Roy, Iosifescu, Dan V (2012). "Mitochondrial modulators for bipolar disorder: A pathophysiologically informed paradigm for new drug development". Australian & New Zealand Journal of Psychiatry. 47 (1): 26–42. doi:10.1177/0004867412449303. PMID 22711881. ^ Kim, Eun Young; Hwang, Samuel Suk-Hyun; Lee, Nam Young; Kim, Se Hyun; Lee, Hyun Jeong; Kim, Yong Sik; Ahn, Yong Min (June 2013). "Intelligence, temperament, and personality are related to over- or under-reporting of affective symptoms by patients with euthymic mood disorder". Journal of Affective Disorders. 148 (2–3): 235–242. doi:10.1016/j.jad.2012.11.065. ISSN 0165-0327. ^ Choi, Seung W.; Schalet, Benjamin; Cook, Karon F.; Cella, David (2014). "Establishing a common metric for depressive symptoms: Linking the BDI-II, CES-D, and PHQ-9 to PROMIS Depression". Psychological Assessment. 26 (2): 513–527. doi:10.1037/a0035768. ISSN 1939-134X. ^ Bauer, M., Pfenning, A. (2005). Epidemiology of Bipolar Disorders. Epilepsia, 46(s4), 8–13. ^ Pfuntner A., Wier L.M., Stocks C. Most Frequent Conditions in U.S. Hospitals, 2011. HCUP Statistical Brief #162. September 2013. Agency for Healthcare Research and Quality, Rockville, MD. "Most Frequent Conditions in U.S. Hospitals, 2011 #162". Archived from the original on 4 March 2016. Retrieved 9 February 2016. ^ Jiang HJ, Barrett ML, Sheng M (November 2014). "Characteristics of Hospital Stays for Nonelderly Medicaid Super-Utilizers, 2012". HCUP Statistical Brief #184. Rockville, MD: Agency for Healthcare Research and Quality. Archived from the original on 11 April 2015. ^ Lopez-Gonzalez L, Pickens GT, Washington R, Weiss AJ (October 2014). "Characteristics of Medicaid and Uninsured Hospitalizations, 2012". HCUP Statistical Brief #183. Rockville, MD: Agency for Healthcare Research and Quality. Archived from the original on 29 November 2014. ^ Jonas BS, Brody D, Roper M, Narrow WE (2003). "Prevalence of mood disorders in a national sample of young American adults". Social Psychiatry and Psychiatric Epidemiology. 38 (11): 618–624. doi:10.1007/s00127-003-0682-8. PMID 14614549. ^ "Experts ponder link between creativity, mood disorders - CNN.com". CNN. 2 April 2009. Archived from the original on 27 March 2010. Retrieved 13 May 2010. ^ Collingwood, Jane. "The Link Between Bipolar Disorder and Creativity | Psych Central." Psych Central – Trusted Mental Health, Depression, Bipolar, ADHD and Psychology Information . Web. 19 November 2011. < "Archived copy". Archived from the original on 22 October 2011. Retrieved 19 November 2011. CS1 maint: Archived copy as title (link)>. ^ Paterek, Liz. "Bipolar Disorder and the Creative Mind." Serendip. 2006. Web. <https://serendipstudio.org/bb/neuro/neuro06/web2/lpaterek.html>. ^ Kaufman, JC (2001). "The Sylvia Plath effect: Mental illness in eminent creative writers" (PDF). Journal of Creative Behavior. 35 (1): 37–50. doi:10.1002/j.2162-6057.2001.tb01220.x. ISSN 0022-0175. Archived from the original (PDF) on 2 March 2012. ^ Bailey, DS (2003). "Considering Creativity: The 'Sylvia Plath' effect". Monitor on Psychology. 34 (10): 42. Archived from the original on 20 October 2008. American Psychiatric Association (2000). Diagnostic and statistical manual of mental disorders, Fourth Edition, Text Revision: DSM-IV-TR. Washington, DC: American Psychiatric Publishing, Inc. p. 943. ISBN 978-0-89042-025-6. Parker, Gordon; Dusan Hadzi-Pavlovic; Kerrie Eyers (1996). Melancholia: A disorder of movement and mood: a phenomenological and neurobiological review. Cambridge: Cambridge University Press. ISBN 978-0-521-47275-3. Sadock, Benjamin J.; Sadock, Virginia A. (2002). Kaplan and Sadock's Synopsis of Psychiatry: Behavioral Sciences/Clinical Psychiatry (9th ed.). Lippincott Williams & Wilkins. ISBN 978-0-7817-3183-6. Carlson, Neil R.; C. Donald Heth (2007). Psychology the science of behaviour (4th ed.). Pearson Education Inc. ISBN 978-0-205-64524-4.